You are currently browsing the category archive for the ‘dolls’ category. 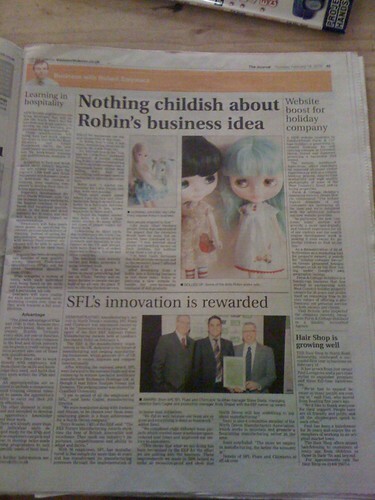 I haven’t had chance to scan the article onto my computer yet however, you can read it online here and see how it looks in the paper from this quick photograph I took on my phone – look how lovely and big the photo of Christmas (Rainy Day Parade) and Tuppence (Miss Sally Rice) is! I was very nervous about the interview and completely freaked out when the Head of Content wanted to send a photographer around to my house to photograph me with my dolls! Needless to say, I politely declined the photographer offer and sent across some of my own pics LOL I am fairly sure everyone involved with the article thinks I am completely potty!! I would like to thank Robert Zarywacz (@RobertZ) for the time he put into the article and for contacting me in the first place! With all my excitement, I have completely neglected the My Little Customs Birthday Celebration Promotions and so, to make it up to you, how about a double whammy over the weekend? 15% off all Saran hair and a surprise FREE GIFT when you spend £16 or more!! The promotion starts from Midnight (GMT) tonight and will run until Midnight (GMT) on Sunday, February 21st! My Little Customs has VERY exciting news!! I am super duper excited, I have been approached with a great offer and of course, I was thrilled to say YES!! I am hoping you will join me in celebrating and to get you all in the party spirit, how about some special offers?? FOR THE ENTIRE MONTH OF AUGUST (yes, the ENTIRE month!) the following AMAZING promotions will be storming ahead! This brings the cost of one skein of Katsilk Saran down from the already great price of £3 to a teeny tiny £2.40 per pack!! *XL Format sized saran? What is this? This, ladies and gents, is another brilliant product which is brand new and literally just arrived with me this morning! My Little Customs is now stocking XL Format sized saran. As I am rather over excited today, I will be adding this to the site at a special introductory price of a mere £7 per pack! You get an awful lot of hair in an XL Format skein, just look at how much you get compared to a standard sized hank!! The XL Format is a massive 31 inches long and weighs 1.5 ounces! The standard format is 18 inches long and weighs only 0.6 ounces. Ideal for Blythe, Tonner, Gene, Tyler and all other larger dollies or, for all you super savvy savers who have spotted that you can get almost 3 times the amount of hair as in the standard pack – just imagine how many Sindy, Barbie, Fleur and other fashion sized doll heads can be rerooted from just the one skein! For now, there are 17 XL Format colours available, the full range of colours will be available shortly. And as if all that wasn’t enough, how about throwing in a little free shipping to the mix? Free shipping? Yup! Spend just £14 or more and get FREE SHIPPING! Have I gone completely mad? Possibly. Should you take advantage of all these amazing saran deals? MOST DEFINITELY!! More Katsilk product ranges will be coming soon so keep your eyes peeled!